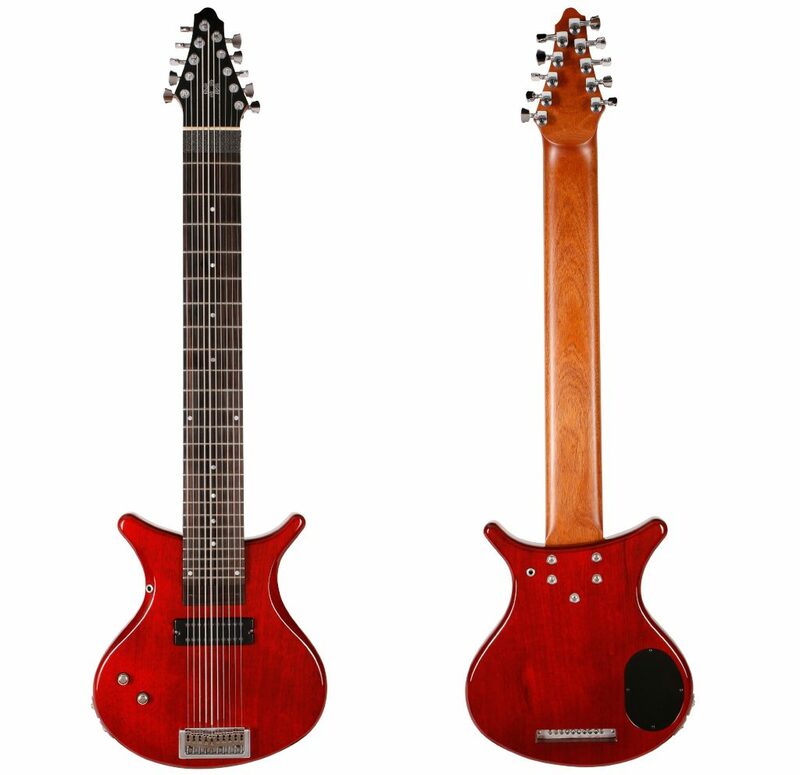 The U10 is a further development of the U8, produced at the same build quality but featuring the extended playing range provided by 10 strings. It’s also the only stereophonic Touch Guitar, aimed at players who might wish to focus on and differentiate the instrument’s polyphonic abilities. The U10 features a similar body to the U8 (slightly smaller than that of the U8 Deluxe), a wider neck to accommodate the greater string range, a single pickup arrangement, and passive electronics. While it remains true to the original Touch Guitar concept of a single self-contained full-range instrument, its design also allows for separate output of the two “bass” and “guitar” ranges if desired. This is achieved via a split stereophonic pickup and a two-plug output socket through which each range is processed separately, plus individual volume controls for each of the two ranges. As with all Touch Guitars®, construction and finishing options (from wood types used through to custom paint and varnish) are discussed with and chosen by the customer, as part of the custom-creation process. 34″ (86 cm) scale length (smaller and lighter than a regular bass guitar, similar feel and heft to a baritone guitar). Extremely well balanced (stays stable in all playing positions). 10 strings with default tuning of D G C F Bb | C G D A C (although any tuning is possible). ABM Custom Bridge with string-through-body system. Damping system on 1st fret (extremely well balanced, stays in place in all positions, but can also be removed easily if necessary). Pickup: 1 x Touch Guitars® Custom Split 5/5 Pickup by Bassculture. Controls: volume (bass side), volume (guitar side). Default two-plug stereophonic output (switches to mono automatically when only one plug is inserted). Finish: default natural clear or sunburst finish (with any other paint and varnish option available, via individual arrangement with customer).